Previously published NZ-based modelling work has explored business-as-usual trends in smoking prevalence, and the potential roles of interventions such as higher regular tobacco tax increases in achieving the NZ Government’s Smokefree Nation 2025 Goal. As best we can model, 10% per annum increases in tobacco tax alone will not be able to achieve the 2025 Goal. In this blog post we outline our favoured package to achieve the 2025 Goal which is ongoing increases in tobacco taxes, intensification of existing evidence-based tobacco control activities and implementation of a major new ‘endgame’ strategy (such as denicotinisation). This package, especially a new endgame strategy, faces political and implementation hurdles that need research, policy analysis and advocacy to overcome. Various surveys, aggregate tobacco consumption data, and the 2013 Census results all indicate that tobacco control is succeeding in reducing smoking prevalence in NZ. There is also widespread support by the public for tobacco endgame strategies (1-5), or at least for increased government action on tobacco control (including among smokers) (6). But the current downward trend in smoking prevalence is very unlikely to get us to the NZ Government’s Smokefree Nation Goal of minimal smoking prevalence by 2025, particularly among relatively high smoking prevalence populations like Māori. See for example publications on projections we have performed: this study (7) and this updated one (8). There are always limitations with modelling-level evidence, but other such work suggests that regular tobacco tax increases will not get NZ to the 2025 goal (even at the 20% annual increase level (9)) – see Appendix A and this previous blog post. Similarly, a gradual reduction of tobacco retail outlets by itself will most likely not get us there (10) (and see this previous blog post). So to help with strategic planning by the NZ health sector, we aimed to outline various strategic options for achieving the Smokefree 2025 Goal. Appendix B covers background information and assumptions relating to this option list. In the table below we have identified three major strategic options. It is assumed that each of these options also includes continuing 10% per annum tobacco tax increases and an incremental approach with a continuation and intensification of existing ‘mainstream’ best practice tobacco control e.g., enhanced mass media, extensions to smokefree policies, and smoking cessation support etc (see footnote to the table for the full list). Option One details this extended business-as-usual approach. In Option Two we add one or more of the current state-of-the-art tobacco control interventions from around the world e.g., plain packaging, banning additives and a minimum retail price for tobacco. In Option Three we add one of four major over-arching interventions which have not yet been implemented internationally but are likely on theoretical grounds to make very substantial contributions to reducing smoking prevalence. 1) Tax increases (10% annually*) + intensified existing evidence-based interventions** Uncertain but probably low Of particular note is the scope for enhanced media campaigns in NZ . However, enhanced media campaigns and cessation support are generally more expensive than smokefree area expansion. The latter can also be done by local government to some extent (though not for a smokefree car law). Various other enhancements were proposed by the Māori Affairs Select Committee . (i) Sinking lid on tobacco supply   . This could also be part of a “regulated market model” . (ii) Denicotinisation of tobacco   (including a recent NZ study by Walker et al: ). (iii) Major tobacco outlet reduction eg, as per an intervention proposed (but not adopted) in the Icelandic Parliament. Each of these major strategies has pros and cons – and more research is needed to determine which would be best. Lessons from other endgames in public health may be relevant. See this blog post. * Our general view is that higher increases in tobacco taxes (e.g., 20% annually) could be justified but only if accompanied by other reforms such as lowering income tax on low-income NZ citizens or other fiscal measures to reduce housing costs, fuel poverty and other forms of poverty. ** Intensification of established evidence-based tobacco control interventions. These include mass media campaigns, smokefree policies, regularly refreshed pictorial health warnings, strengthening of retailer controls to reduce accessibility of tobacco products, strengthening of marketing controls, highly accessible evidence-based smoking cessation support, and full implementation of FCTC section 5.3 interventions on preventing the influence of the tobacco industry on public health policy. Obviously ongoing research should inform effectiveness and cost-effectiveness of these interventions so that the mix can be optimised to make best use of limited health sector resources. Modelling work suggests that Option One is unlikely to achieve the Smokefree 2025 goal, and we suspect that adding one or more state-of-the-art interventions used internationally is also unlikely to be sufficient. Our judgement is that Option Three in the above table would maximise chances of reaching minimal smoking prevalence by 2025. The specific component involving a major new intervention would need to be determined by further research, expert deliberation and consensus within the health sector, and policy analysis – followed by political will. We also suggest that of the state-of-the-art interventions detailed, plain packaging at least should also be implemented in the light of the very promising findings about its impact in Australia (see this blog post), and its advanced stage in NZ’s legislative process. For all these options, ongoing efforts will also be needed to highlight the benefits of tobacco control in terms of potential health gain (25) and reduction in health inequalities (26,27). When current trends are considered, reaching the Smokefree 2025 goal will probably not be achieved. Our favoured package (ongoing annual tax increases [at 10%], intensification of other established evidence-based tobacco control interventions, and a major new additional strategy [option three above]) would help maximise the chances of success. However, this package, especially a new endgame strategy, faces political and implementation hurdles that need research, policy analysis and advocacy to overcome. Statement on Competing Interests: None of the authors have any competing interests – including no links with pharmaceutical companies. Their work on tobacco epidemiology and control is either funded by competitive research grants or is from voluntary efforts. Appendix A: Modelling results giving the projected prevalence of daily adult smoking in 2025 with yearly increases in tobacco excise tax from 2011 onwards of between 0% and 20% (reproduced from Tobacco Control (9)). Note: Mean results presented with 95% uncertainty intervals. We considered various endgame literature (the May 2013 Supplement of the journal Tobacco Control) and previous NZ work e.g., by Laugesen et al (28) and Thomson et al (29). We assumed that prohibition is probably not a politically feasible option (see this blog post by Richard Edwards) – though at very low smoking prevalence levels it may become feasible (possibly combined with smokers’ licenses (30,31)). We assumed that the illicit market for tobacco would continue to remain very small in NZ (as an island nation with no local production) and would not be a major impediment in achieving progress towards the goal (e.g., see this modelling work on tobacco tax increases which considered the growth of the illicit market (9)). We assumed that the “tobacco-free generation” idea (32) seems unacceptably slow in the NZ context even for a delayed endgame goal of say 2030 or 2040 (although it is a step we consider logical, ethical [why let a new generation get hooked, only to have to quit again], and likely to contribute to denormalisation). We assumed that a specific nicotine tax would not be a particularly viable option for NZ at present (given the focus on the ongoing current tobacco tax increases). We assumed that e-cigarette regulations currently in NZ will be hard to change politically and that consumption of these products will remain relatively minimal in this country (albeit with some increase in internet purchases by individuals as tobacco taxes or other restrictions in Table 1 increase prices and/or alter normal cigarette design). 1. Edwards R, Peace J, Russell M, Gifford H, Thomson G, Wilson N: Qualitative exploration of public and smoker understanding of, and reactions to, an endgame solution to the tobacco epidemic. BMC Public Health 2012, 12:782. 2. Jaine R, Healey B, Edwards R, Hoek J: How adolescents view the tobacco endgame and tobacco control measures: trends and associations in support among 14-15 year olds. Tob Control 2014. 3. Maubach N, Hoek JA, Edwards R, Gifford H, Erick S, Newcombe R: ‘The times are changing’: New Zealand smokers’ perceptions of the tobacco endgame. Tob Control 2013, 22(6):395-400. 4. Wilson N, Edwards R, Thomson G, Weerasekera D, Talemaitoga A: High support for a tobacco endgame by Pacific peoples who smoke: national survey data. N Z Med J 2010, 123(1316):131-134. 5. Gendall P, Hoek J, Maubach N, Edwards R: Public support for more action on smoking. N Z Med J 2013, 126(1375):85-94. 6. Edwards R, Wilson N, Peace J, Weerasekera D, Thomson GW, Gifford H: Support for a tobacco endgame and increased regulation of the tobacco industry among New Zealand smokers: results from a National Survey. Tob Control 2012, [E-publication 27 April]. 7. Ikeda T, Cobiac L, Wilson N, Carter K, Blakely T: What will it take to get to under 5% smoking prevalence by 2025? Modelling in a country with a smokefree goal. Tob Control 2013, (E-publication 26 September). 8. van der Deen F, Ikeda T, Cobiac L, Wilson N, Blakely T: Forecasting future smoking prevalence in a country with a smokefree goal for 2025: New Zealand. N Z Med J (In press). 9. Cobiac LJ, Ikeda T, Nghiem N, Blakely T, Wilson N: Modelling the implications of regular increases in tobacco taxation in the tobacco endgame. Tob Control 2014, [E-publication 21 August]. 10. Pearson AL, van der Deen FS, Wilson N, Cobiac L, Blakely T: Theoretical impacts of a range of major tobacco retail outlet reduction interventions: modelling results in a country with a smoke-free nation goal. Tob Control 2014, [E-publication 18 July]. 11. Edwards R, Hoek J, van der Deen F: Smokefree 2025–use of mass media in New Zealand lacks alignment with evidence and needs. Aust N Z J Public Health 2014, 38(4):395-396. 12. Blakely T, Thomson G, Wilson N, Edwards R, Gifford H: The Maori Affairs Select Committee Inquiry and the road to a smokefree Aotearoa. N Z Med J 2010, 123(1326):7-18. 13. Zablocki RW, Edland SD, Myers MG, Strong DR, Hofstetter CR, Al-Delaimy WK: Smoking ban policies and their influence on smoking behaviors among current California smokers: a population-based study. Prev Med 2014, 59:73-78. 15. Levy DT, Pearson JL, Villanti AC, Blackman K, Vallone DM, Niaura RS, Abrams DB: Modeling the future effects of a menthol ban on smoking prevalence and smoking-attributable deaths in the United States. Am J Public Health 2011, 101(7):1236-1240. 16. Durkin S, Brennan E, Wakefield M: Mass media campaigns to promote smoking cessation among adults: an integrative review. Tob Control 2012, 21(2):127-138. 17. McLaughlin I, Pearson A, Laird-Metke E, Ribisl K: Reducing tobacco use and access through strengthened minimum price laws. Am J Public Health 2014, 104(10):1844-1850. 18. Thomson G, Wilson N, Blakely T, Edwards R: Ending appreciable tobacco use in a nation: using a sinking lid on supply. Tob Control 2010, 19(5):431-435. 19. Edwards R, Russell M, Thomson G, Wilson N, Gifford H: Daring to dream: reactions to tobacco endgame ideas among policy-makers, media and public health practitioners. BMC Public Health 2011, 11:580. 20. Wilson N, Thomson GW, Edwards R, Blakely T: Potential advantages and disadvantages of an endgame strategy: a ‘sinking lid’ on tobacco supply. Tob Control 2013, 22 Suppl 1:i18-i21. 21. Borland R: A strategy for controlling the marketing of tobacco products: a regulated market model. Tob Control 2003, 12(4):374-382. 22. Donny EC, Hatsukami DK, Benowitz NL, Sved AF, Tidey JW, Cassidy RN: Reduced nicotine product standards for combustible tobacco: Building an empirical basis for effective regulation. Prev Med 2014, (E-publication 23 June). 23. Tengs TO, Ahmad S, Savage JM, Moore R, Gage E: The AMA proposal to mandate nicotine reduction in cigarettes: a simulation of the population health impacts. Prev Med 2005, 40(2):170-180. 24. Walker N, Fraser T, Howe C, Laugesen M, Truman P, Parag V, Glover M, Bullen C: Abrupt nicotine reduction as an endgame policy: a randomised trial. Tob Control 2014, [E-publication 14 November]. 25. Blakely T, Carter K, Wilson N, Edwards R, Woodward A, Thomson G, Sarfati D: If nobody smoked tobacco in New Zealand from 2020 onwards, what effect would this have on ethnic inequalities in life expectancy? N Z Med J 2010, 123(1320):26-36. 26. Blakely T, Fawcett J, Hunt D, Wilson N: What is the contribution of smoking and socioeconomic position to ethnic inequalities in mortality in New Zealand? Lancet 2006, 368(9529):44-52. 27. Brown T, Platt S, Amos A: Equity impact of population-level interventions and policies to reduce smoking in adults: a systematic review. Drug Alcohol Depend 2014, 138:7-16. 28. Laugesen M, Glover M, Fraser T, McCormick R, Scott J: Four policies to end the sale of cigarettes and smoking tobacco in New Zealand by 2020. N Z Med J 2010, 123(1314):55-67. 29. 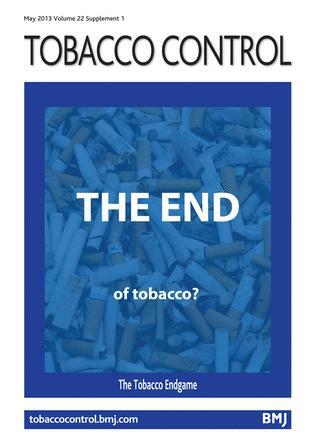 Thomson G, Edwards R, Wilson N, Blakely T: What are the elements of the tobacco endgame? Tob Control 2012, 21:293-295. 30. Chapman S: The Case for a Smoker’s License. PLoS Med 2012, 9(11):e1001342. 31. Halliday D: The ethics of a smoking licence. J Medical Ethics 2013, [E-publication 11 December]. 32. Berrick AJ: The tobacco-free generation proposal. Tob Control 2013, 22 Suppl 1:i22-26.